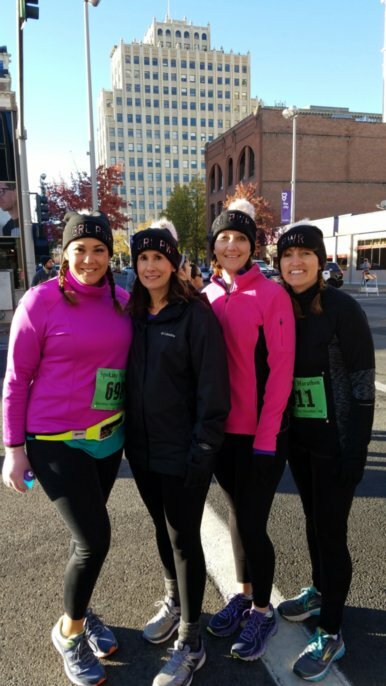 I was blessed to be able to train for and run another half marathon in Spokane, WA with some amazing women from my church last weekend. 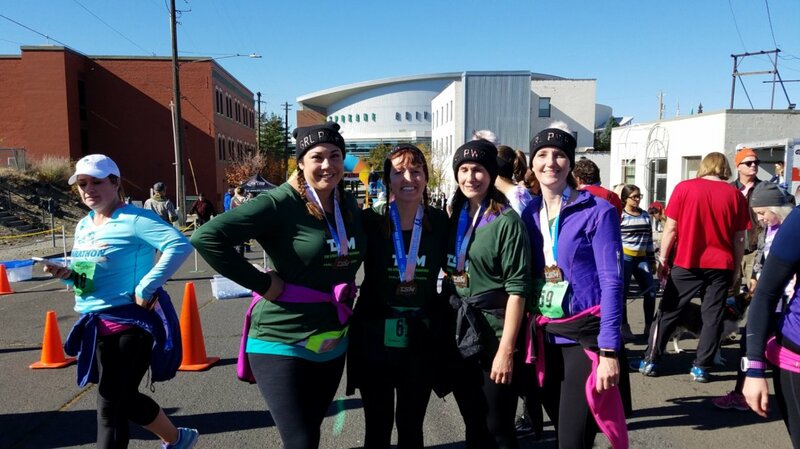 This half marathon was not so much about personal accomplishment, but really it was so much about accountability this time for me. 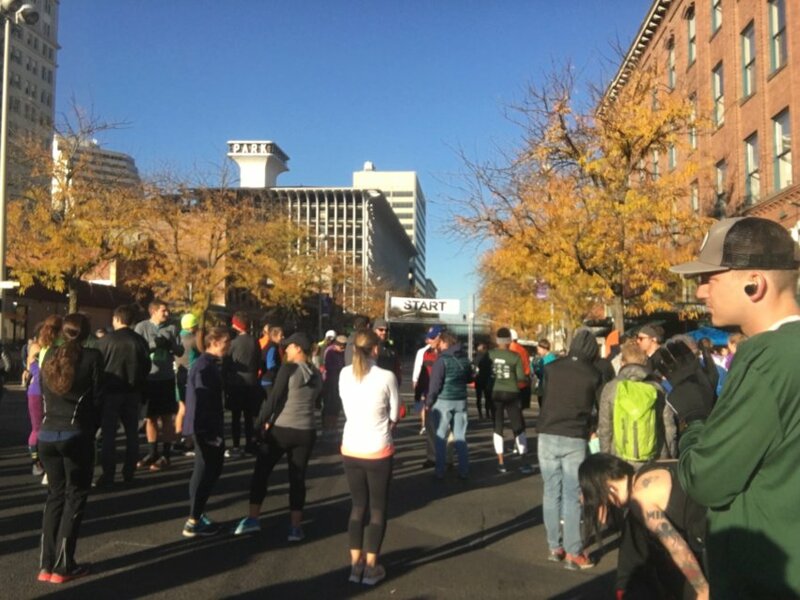 The race starting line. It was about 34 degrees. There were 4 of us from church who were running the race. We got a group text going to keep each other accountable with our training. We would text each other and make plans to run together or tell each other how far we ran that day. It was motivating when I saw that everyone had gotten their 5 miles in. That meant I needed to get my 5 miles in as well. The gals (Madison, Shelly, me and Jenny) at the start of the race. I can’t say enough about these women. 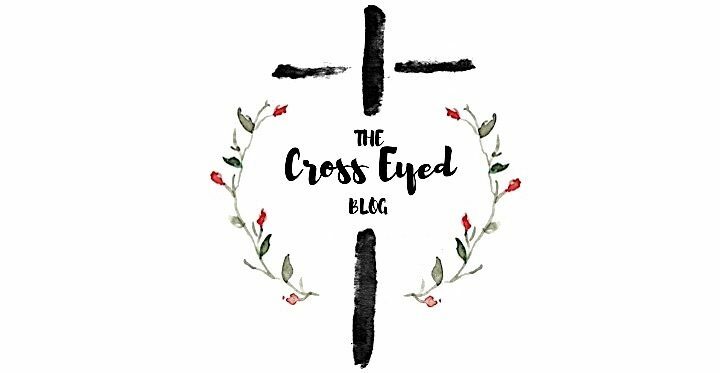 The way they love Jesus is amazing. One time we ran up the Rattlesnake trail for an 8 mile run, and Shelly was reciting scripture based on the letters of the alphabet. I was just trying to breathe. Talk about iron sharpening iron. That was an inspiration to me. 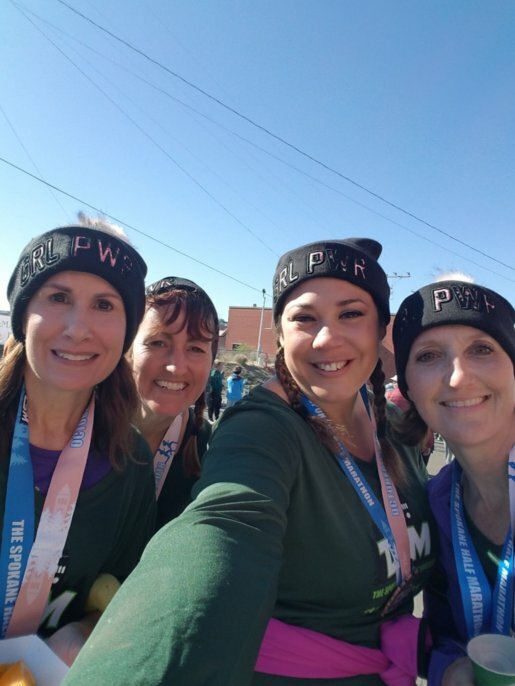 Did you catch a glimpse of those cute hats that we were wearing on race day? We all knew it was going to be cold when the race started, but Madison & I had not brought gloves or a hat. We went to Wal Mart, and there were 4 of the same hat that said GRLPWR (aka “girl power”). I thought at our next race we should make shirts that said “GRLPWR thru GODPWR”. We’ll see! I can’t say enough about this gal, Madison. She kept me going. I would have probably walked a lot after mile 10. She manned the beeper and told us when to run and when to walk. She encouraged me to pray. She encouraged me to push myself harder than my body said I could. Thank you so much girl! You are a shining light for Jesus! 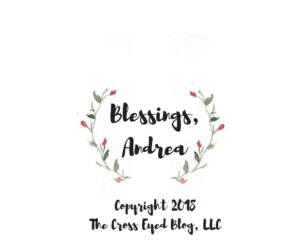 I consider myself blessed to call you friend. This is us at the end of the race. What a relief we were done! Will this be the last race I do? I don’t know. I loved the accountability of this group. You gals encouraged me to be better physically as well as spiritually. I am thankful for that. 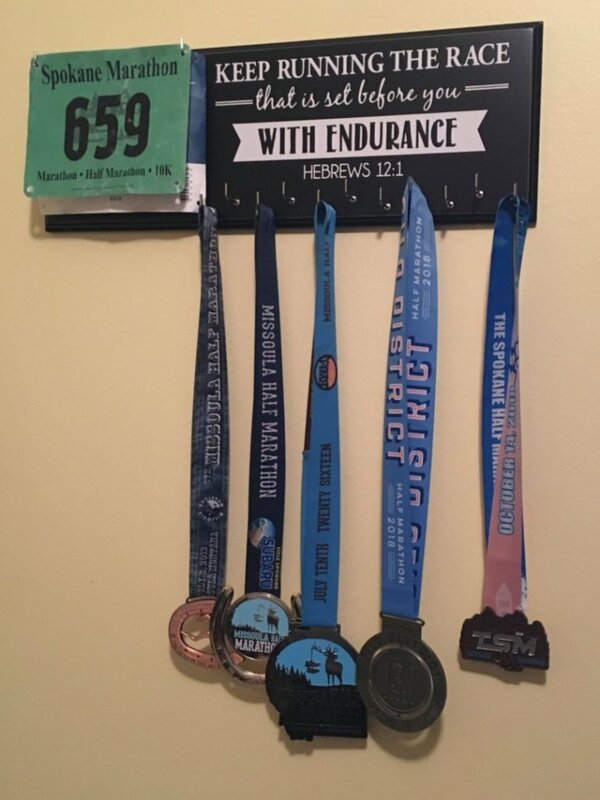 After my last half marathon, I bought a rack so I could display my medals rather than having them in my closet in a box. I have it hanging in my office, and it reminds me that I can go farther than I ever thought I could. I could run the race with endurance with Jesus spurring me on, protecting me, and this time with an incredible group of women by my side. God is good. 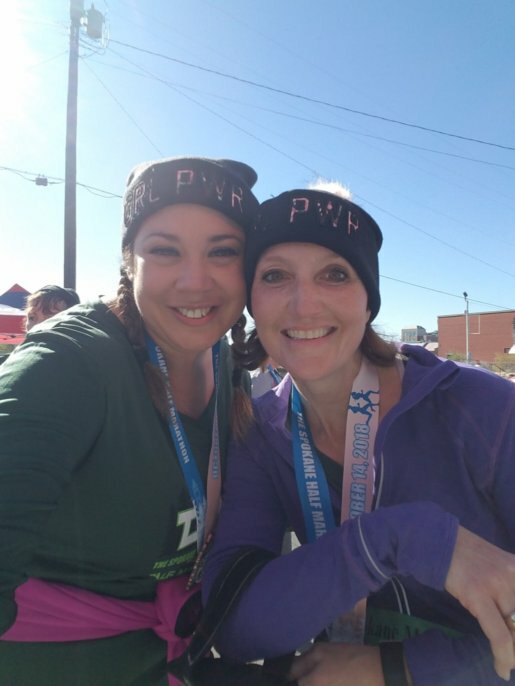 Interested in reading another blog about a half marathon I ran in Waco, TX at the Magnolia Silos. Check out Silo Marathon 2018 in Waco, TX.